In late 2018 the Daily Oil Bulletin surveyed 120 representatives from all subsectors of the oilfield services industry to gauge how the industry performed in 2018 compared to 2017, and to get a sense of the sector expects 2019 to play out. In this six-part series, Vince Lauerman sifts through the results of the 4th annual Service & Supply Outlook Survey to identify key trends in the sector. Parts one, two and three of the series looked at the financial performance of oilfield service companies in 2018, and expectations for this year. Parts 4-5 examine the market conditions the industry faced last year, and expectations for this year (click here for part four, and here for part five). Today’s installment looks at how oilfield service companies view the challenges of implementing technology in their operations. Most Canadian oilfield service companies continue to foresee rapid technological innovation fundamentally disrupting the way they do business over the next several years. 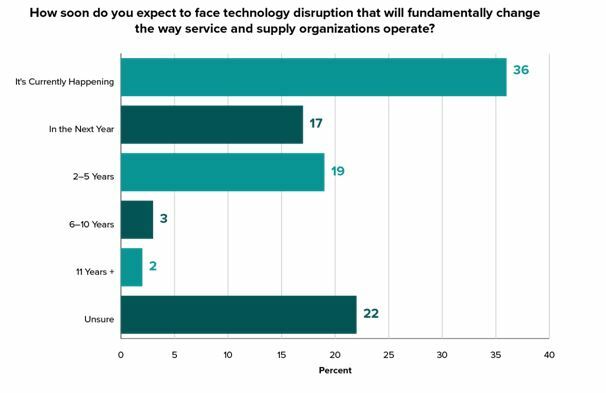 Over half of survey respondents said they expect this to be the case within the next year, and almost three-quarters expect substantial technological disruption within the next five years. But this is a significant drop off from last year’s survey, when 84 per cent of service companies expected rapid technological innovation to fundamentally disrupt their industry within five years. The major driver for this shift is the number of companies saying they are unsure about the impact and/or timing of technological innovation, increasing 14-percentage points to 23 per cent between the two surveys. The perception of slower technological advancement, or at least greater uncertainly about its timing, combined with a fair amount of financial distress in the service industry appear to be negatively impacting the importance companies are placing on investing in new technologies and funding for such investments. For example, 51 per cent of service companies said investing in new technology is more important today compared to the oil price heyday mid-decade, but this is a 12-percentage point drop from last year’s survey. Fifteen per cent of respondents said new technologies are less important, compared to 10 per cent last year, while 30 per cent said it is the same – for a 7 point rise. Most Canadian service companies may foresee rapid technological advancement fundamentally disrupting their industry over the next several years, but this is much less the case for companies with revenue in the $50-$100 million range. Only 40 per cent of these companies expect substantial technological disruption within the next five years, roughly half as many as other service companies. The discrepancy between service companies in the $50-$100 million revenue range and the other companies is especially great for those believing rapid technological innovation will change the way they do business in the next year, zero per cent of respondents compared to 18 per cent, respectively. 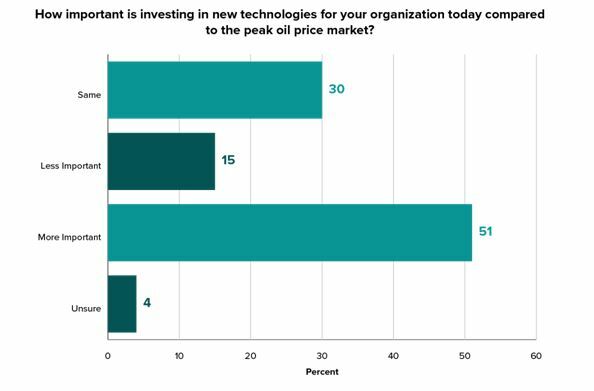 This relative skepticism about the impact of technology by service companies in the $50-$100 million revenue range also showed up when asked how important is investing in new technologies today compared to the mid-decade oil market peak. Only 20 per cent of respondents with revenue in the $50-$100 million range said it was more important, less than a third of those in the $5-$20 million range, the other extreme. At the same time, 20 percent of companies in the $50-$100 million range said investing in new technologies is less important than during the peak, five times more than the those in the $5-$20 million revenue range. The majority of companies in every sub-sector of the Canadian oilfield service industry may expect rapid technological advancement will disrupt how they do business over the next five years, but there is still significant variance between the sub-sectors. 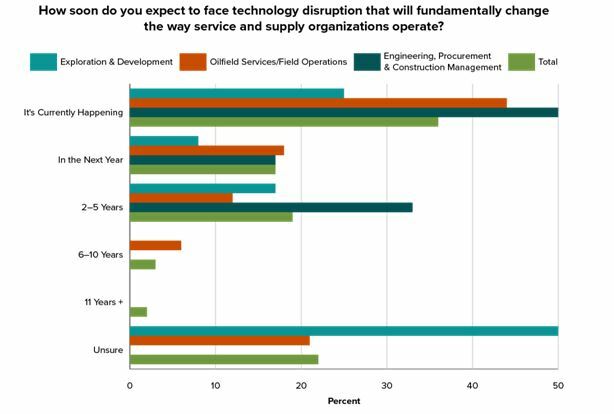 The engineering, procurement and construction management sub-sector is the most concerned about the impact of technology on their business, with every respondent saying it would cause fundamental change over the next five years. Half said it is already happening, 17 per cent expect it in the next year, and a third of companies in the two-to-five year timeframe. 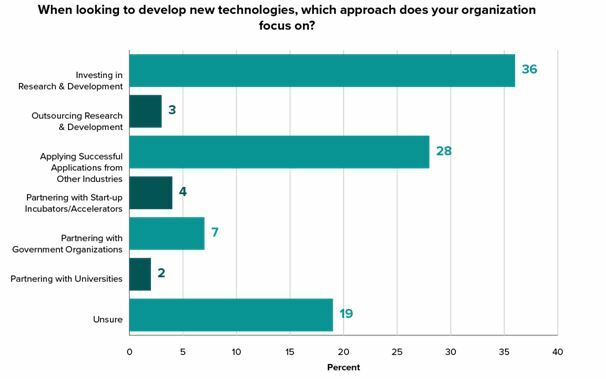 In contrast, only half of companies focused on exploration and development said technological disruption would fundamentally change the way they do business in the next five years. The other half of companies were unsure of timing and/or impact. The oilfield services/field operations sub-sector tracked the industry as a whole, with almost three-quarters expecting technological advancement to cause fundamental change within the next five years, 21 per cent unsure of the impact, and the remaining 6 per cent saying technological disruption would take more than five years. 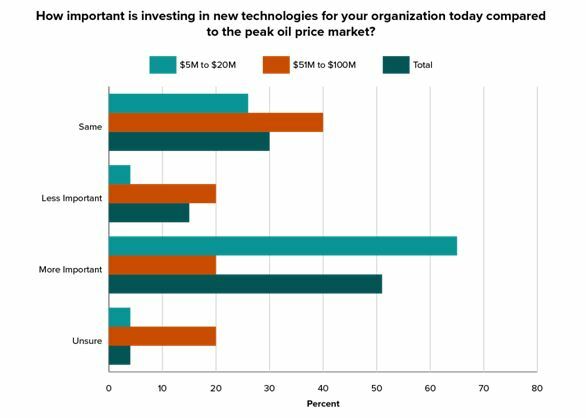 For the related question, the importance of investing in new technologies today compared to the mid-decade oil price peak, the exploration and development sub-sector again placed the least importance on technology, companies specializing on instrumentation and controls the most importance, with the oilfield services/field operations sub-sector more middle of the pack. 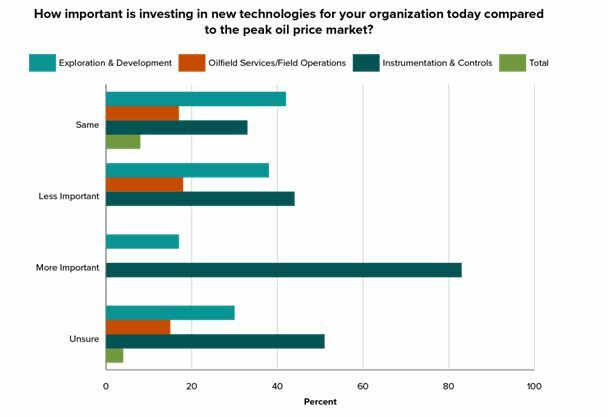 Only a third of respondents focusing on exploration and development said investing on new technology is more important today than during the peak, compared to 83 per cent in the instrumentation and controls sub-sector and 44 per cent of companies specializing in oilfield services/field operations. A large proportion of oilfield service companies are again planning to use their own financial resources to fund new innovation projects, but an increasing number of companies plan to rely on outside sources of finance, while significantly more are simply opting out of such projects altogether. Two-thirds of survey respondents said they plan to use their own financial resources, when asked to select their top two methods of funding new innovation projects. Nineteen per cent reported plans to rely on R&D tax credits, 18 per cent plan to apply for government grants, and 9 per cent said they plan to rely on loans. Tax credits and loans each represented a 4-percentage point increase from last year’s survey. Nine per cent of respondents reported partnering with other companies to fund projects, compared to 22 per cent the year before, while companies with no plans for new innovation projects more than doubled to 17 per cent. 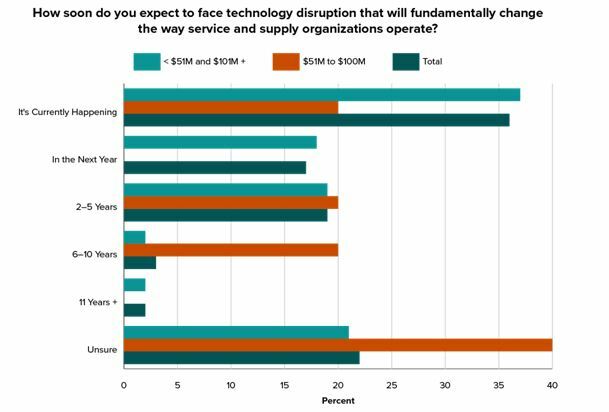 The shift in perception of the impact and/or timing of technological innovation on the service industry had no apparent impact on approaches companies focus on to develop new technologies, as survey respondents provided similar answers this year and last. Thirty-six per cent of companies said they will focus on their own R&D efforts to develop new technologies, 28 per cent will apply successful applications from other industries, and 13 per cent reported they would partner with either government organizations, start-up incubators/accelerators, or universities. In terms of methods employed by the service industry to develop new technologies, there is a significance difference between small (less than $5 million in revenue) and larger companies, with the former more reliant on partnering and the latter on their own resources. Forty-two per cent of larger companies reported they will focus on their own R&D efforts to develop new technologies, compared to 27 per cent of small companies. In addition, 35 per cent of larger companies said they will apply successful applications from other industries to develop new technologies, almost two times more than small companies. On the flip side, almost a quarter of small companies reported they would partner with either government organizations, start-up incubators/accelerators or universities to develop new technologies, four time more than larger companies. 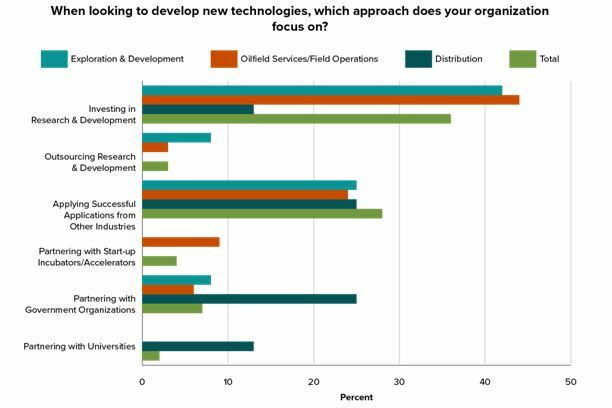 There is a great deal of divergence between sub-sectors in the oilfield service industry in term of methods employed to develop new technologies, especially regarding reliance on their own resources versus partnering with other organizations. The exploration and development sub-sector and companies focusing on oilfield services/field operations are relatively middle of the road. Forty-two per cent of the former and 44 per cent of the latter reported focusing on their own R&D efforts to develop new technologies. At the same time, 8 per cent of respondents specializing on exploration and development said they would partner with either government organizations, start-up incubators/accelerators or universities to develop new technologies, and 15 percent of companies from the oilfield services/field operations sub-sector. In contrast, only 13 per cent of companies focusing on distribution said they will focus on their own R&D efforts to develop new technologies, and 38 per cent reported plans to partner with outside organizations. Another factor that may be causing the downdraft in funding for technological innovation by service companies is the failure of the industry to capture the full value of productivity improvements through technology or process changes from their customers. Only 10 per cent of survey respondents said they are very successful at doing so, roughly half of those who reported they have been not successful at all. Almost half of the companies said they were somewhat successful, and 22 per cent have captured part of their investment. 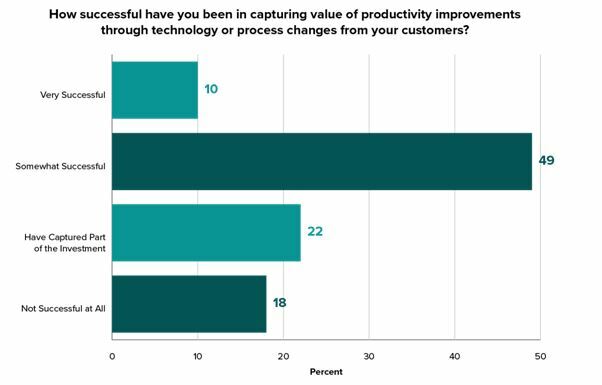 In terms of revenue strata, oil field service companies tend to clump in terms of being very successful at capturing the full value of productivity improvement through technology or process changes from their customers, around 10 per cent, and having captured part of their investment – 22 per cent. In contrast, 60 per cent of mid-revenue companies ($5-$100 million) reported they have been somewhat successful in capturing full value of their technology investment from customers, compared to 43 per cent of small and large companies. At the same time, only 6 per cent of mid-size companies said they were not at all successful, whereas over a quarter of small and large companies reported the same. 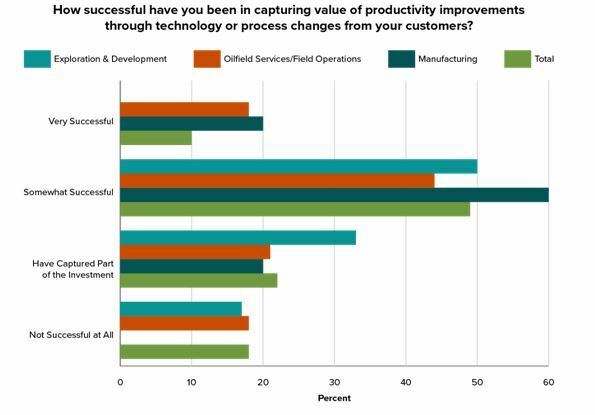 The manufacturing sub-sector has been the most successful in the services industry to capture full value of productivity improvements through technology or process change from their customers. Twenty per cent reported being very successful, 60 per cent somewhat successful, and the final 20 per cent having captured part of their investments. In contrast, companies specializing on exploration and development have been one of the least successful sub-sectors at capturing full value. None of them reported being very successful, and 17 per cent said they had been not at all successful. The oilfield services/field operations sub-sector was more middle of the pack, with 18 per cent reporting being very successful at capturing value from technological investments, 44 per cent somewhat successful, and 21 per cent capturing part.